Windows Azure Platform is the Microsoft cloud computing service that helps enterprise users build enterprise cloud applications that are scalable, secure and robust. According to recent research, public cloud spending in Europe, the Middle East and Africa will reach $2.78B in 2018, compared to $2.15B for on-premises, and $1.54B for hosted. These statistics clearly signify the rise in enterprise adoption of cloud services and solutions. But before diving in further, let us first understand the basics of cloud computing and Azure app development. Looking to develop an application using Azure?We can help you! Cloud computing is a common term used for the delivery of hosted services provided through the Internet. There are three methods used to implement cloud computing: Infrastructure as a Service (IaaS), Software as a Service (SaaS), and Platform as a Service (PaaS). Cloud computing services can be private, public or hybrid. Control: It provides the freedom to spin up computing resources for almost any type of workload on-demand to the end users. Scalability: Organizations can easily scale up as per the increasing computing needs and then scale down again as demands decrease. Security: Azure provides peace of mind to users by protecting enterprise data migrated from on-premise applications to Azure Cloud Data Centers. Pay per use: The cloud resources are measured at a granular level, allowing users to pay only for the resources and workloads they use. Microsoft Azure Cloud Services provide a scalable and error-tolerant environment that helps enterprise users & developers create powerful applications without the need to purchase and configure hardware and operating systems. In simpler terms, it caters to your cloud computing needs. Microsoft provides various cloud services and out-of-the-box Azure cloud solutions that can help many organizations setup robust process-centric business infrastructure and achieve competitive edge. 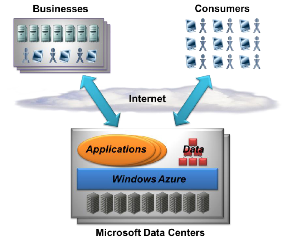 Azure’s Platform-as-a-Service (PaaS) approach is used to host business web applications, whether they are web pages or web services. The platform, apart from providing a host to run application logic, also includes vigorous mechanisms for managing all aspects of web application lifecycle. Right from configuring continuous and staged deployments to managing runtime configuration, monitoring health and diagnostic data, and of course helping with scale and resilience. 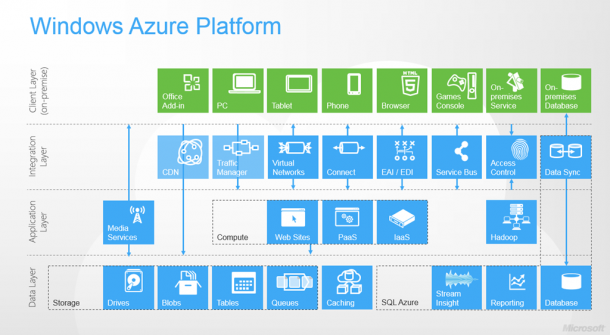 Given below is an overview of the services delivered by Azure platform. With our Windows Azure development services, Rishabh Software has helped many small to medium enterprise achieve enterprise cloud adoption. We develop cloud solutions and help achieve migration and integration of legacy systems to Azure through deploying internal portals, content management web apps and mobile services.